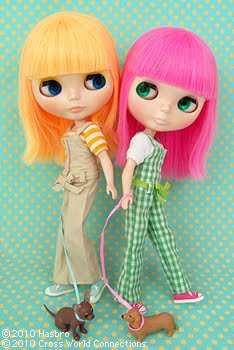 Neo Blythe "Simply Mango" and "Simply Guava"
Simply Mango wears a orange-striped top with a beige salopette. The top of her salopette fits her body and there are three yellow buttons at the front. The strap is crossed at the back, and its low rise waist is marked with a belt made of a beige cotton ribbon. The pants are a little bit loose and wider at the bottom so she can run and jump! She always wears her light blue sneakers when she walks her beloved Chihuahua. 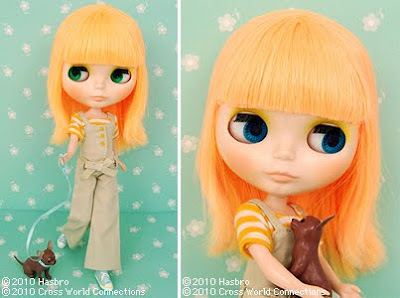 Her hair style is a neon orange straight semi-long hair with bangs. Her makeup is a yellow eye shadow with orange lips and blush. Her face type is Radiance, and her skin type is Fair. Simply Guava wears a white top with a green gingham-check salopette. The top of her salopette fits her body and there are three white buttons at the front. The strap is crossed at the back, and its low rise waist is marked with a belt made of a yellow green cotton ribbon. She always wears her vivid pink sneakers when she walks her beloved Miniature Dachshund. 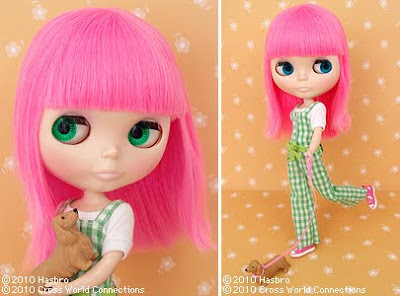 Her hair style is a neon pink straight semi-long hair with bangs. Her makeup is a light purple eye shadow with light pink lips and pink blush. The set includes: Doll, shirt, salopette, sneakers, underwear, Miniature Dachshund, lead for Miniature Dachshund, and stand.